To answer your question, I don't notice any difference in handling or anything at all (as expected). If there is a difference, it would be very minute. Hmm, I just thought of another idea for next season... carbon fiber sunroof glass replacement... I'll write it here so I don't forget! Nice work on your car. How do you like the IMSA scoops? How's the quality and fitment? Oh I like this! That is going in my list. I took some pictures after finally washing it today. Hopefully this does the diffuser more justice. I still have to do something about those exhaust plates.. they're all burnt. I have a wire brush in the garage. I could give it a shot tomorrow. I'm so sad... the car must be put away for the winter again in the next week. Next year I'll be able to keep it on the road for an extra month or two... I'll be done school. Good luck with school man, I am right there with ya. Make sure no critters find a home in your pride and joy. 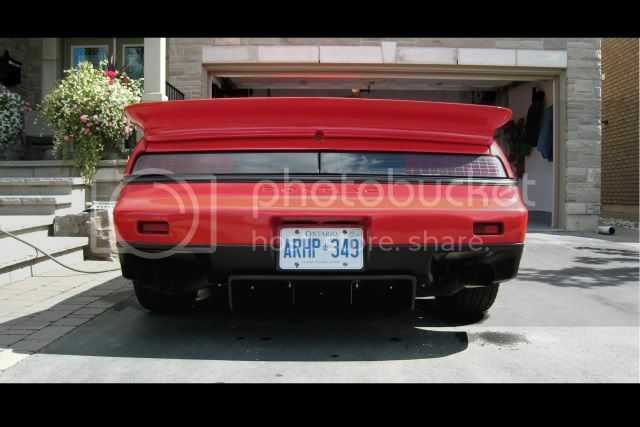 Did you ever consider intergrating the diffuser into the rear bumper ? In other words making some cuts and glassing it in to give it a more factory look ? It would be a lot of work of course, unless you had one of the fiberglass bumpers from Jimmy S.
exoticse, I've thought about integrating it, but I think it would be a lot of work. 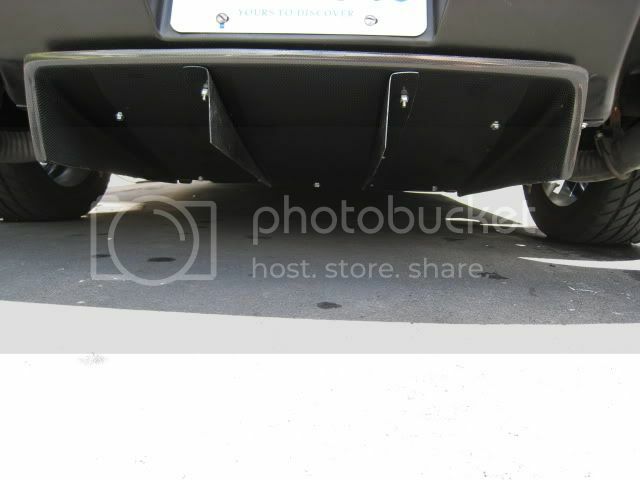 I don't have any experience with fiberglass, and the diffuser is carbon fiber so I'm not sure how I could even fuse the two of them. Also, I like the fact that I can remove the diffuser so I can access certain areas for service. If it was one piece, I would have to remove the entire rear bumper. It would probably turn into more of a pain than I want lol. Back to university and collecting parts! I have to put my car away in about a month. Going to miss driving it, but will enjoy (for the most part) restoring it from the ground up. Also... I have a very, very cool project in the works that is related to my engineering program that I will be applying to the fiero. Won't be done for months, but when its finished, it will be really, really cool. Keep an eye out! Can't have this thread on the second page! Oh please oh please don't put on that stupid ricer metal spoiler!! Don't worry, the "ricer metal" spoiler won't be going on the car for the street. 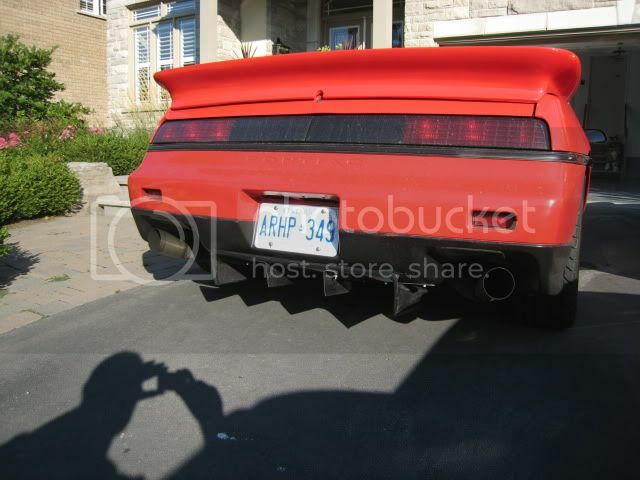 I will be keeping my IMSA spoiler and decklid for the street. I'll just spill the beans on the project right now. Myself and a couple other friends are ground up engineering a spoiler and front splitter for my car. It will be purpose built for track events, and there will be a twist to it. We currently have most of the design done (thats an old picture), and will soon be building it. 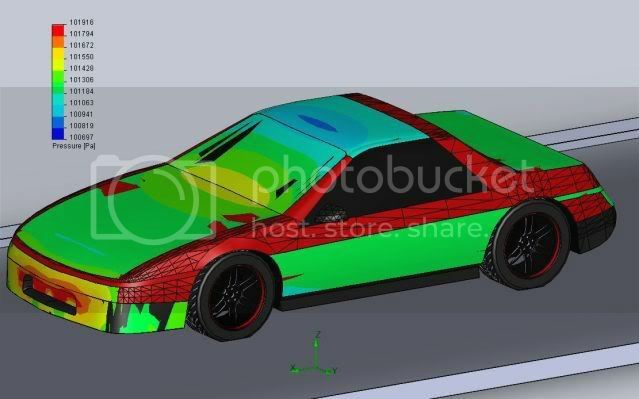 It will be all aluminum and composite (carbon fiber). Unfortunately we cannot wind tunnel test it (don't have the funds) but we have access to numerous CFD programs that we've used to design it. It WILL be functional, only for the track. 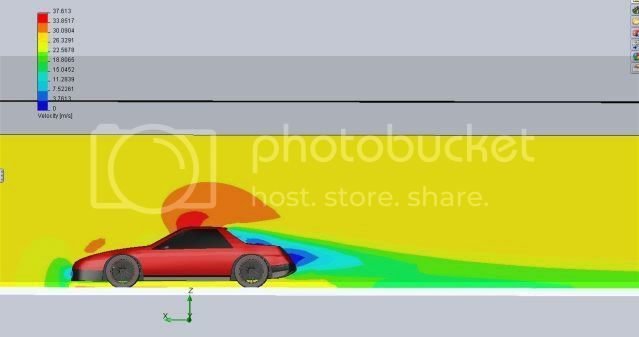 It seems to me that your design project is focused on creating downforce by utilizing the flow splitter/air dam/diffuser to minimize and control airflow underneath the car and to supplement downforce by placing the high mount spoiler in undisturbed air. All of which may be counter productive to cooling the engine. 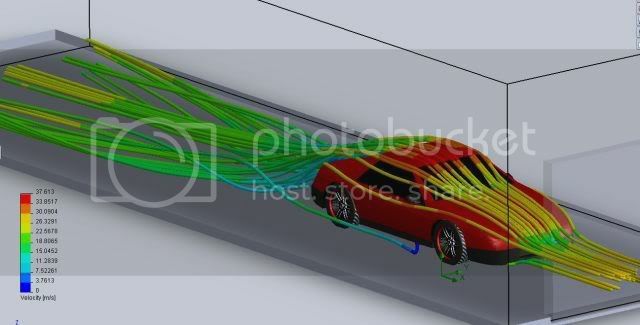 Others often install hood extractors, flooor pans, and NACA ducts to induce air flow through the radiator / engine compartments, doing so will alter the flow drawings you have shown so far. This is good stuff! Make sure you post all of your findings please. I'm putting together a pretty thorough analysis of things, and eventually I will post some flow data up. Problem with some of the things you requested such as rad flow, is that it would require a much more complex model. Eventually I may try it out for fun, but at this point things are kept relatively "simple." Should make working on the cars a lot easier! Thanks guys, finished up the install today. so , what brand and where did you get the lift from? i have been thinking about a lift like this for a while .looks great ! The lift doesn't seem to have a "brand", although the power unit is a monarch. Everything is North American made, and I got it from "The Lift Super Store" here in Oakville. Went together easily, didn't put up a fight. Fit and finish looks nice, and it wasn't overly expensive. If you're interested, pm me and I can tell you the price and give you some contact info. Are you going to install the door track kit that routes the door straight upwards with a small return at the top. 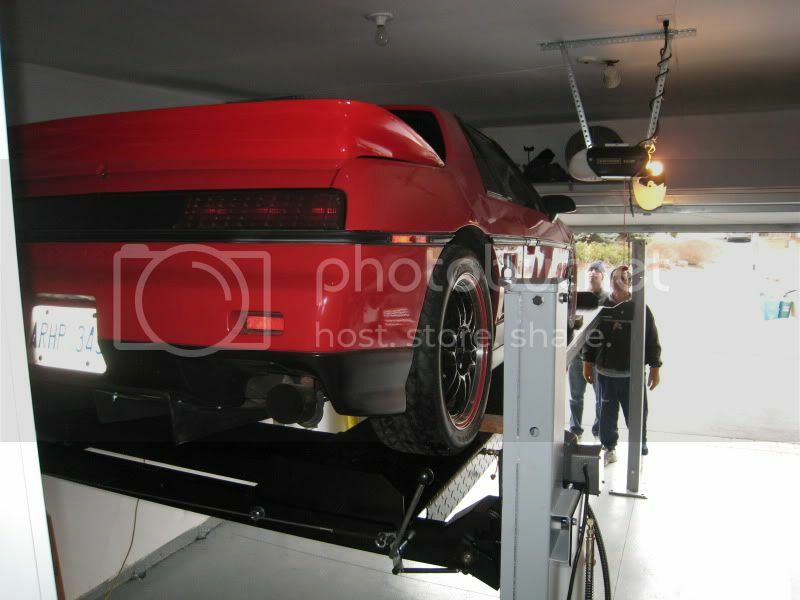 It enables you to have a car raised on the hoist and still open the door? We looked into raising the runners for the garage door, but it was an expense/project that we didn't want to take on just yet. 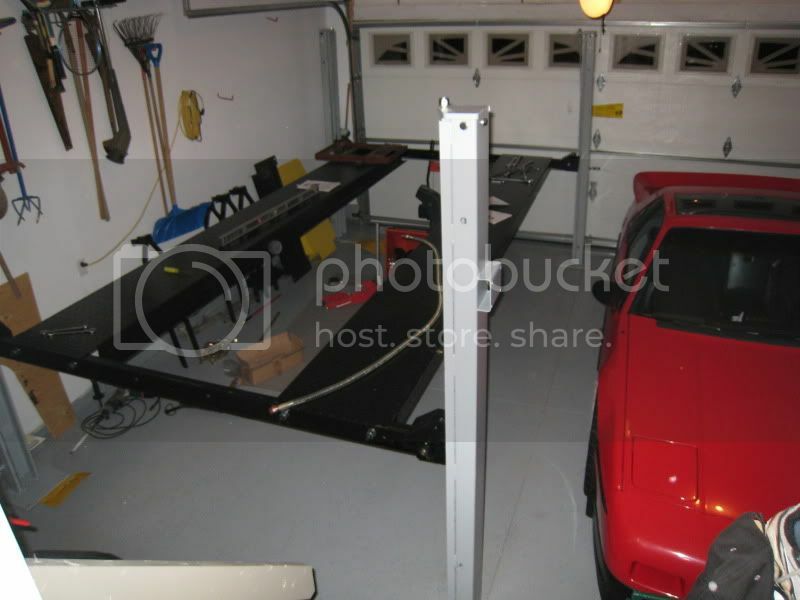 Currently we can fit two sports cars, one on top of the other, with the garage door open. 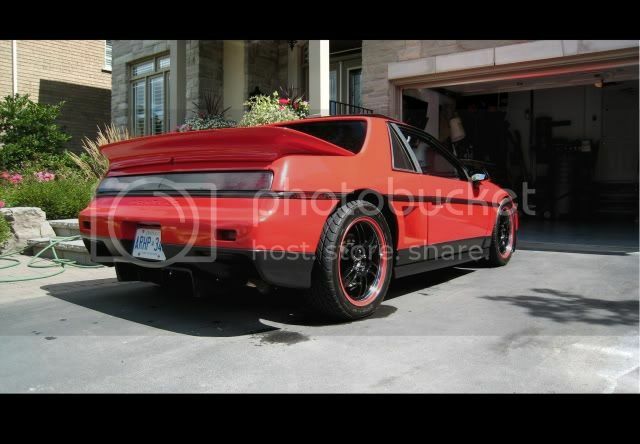 Also, with the garage door open and the fiero in the air, I can comfortably get underneath. I can't stand straight up, but I'm only slightly crouching. Cool ! As long as the electric door opener cannot fling the garage door into the windsheild of the car on the lift, it looks like you dont have to do any thing more. Can't wait to start wrenching on it again! Only a little while longer.. In my opinion, you have, by far, the best looking notchie I've ever seen. Part of that is definately the spoiler. I understand that the aerodynamics could most definitely be improved upon with larger and taller wing, I just hope it doesn't come out too gaudy. I absolutely love the way it looks now! Red 86GT 4 Speed "MrDrift"
That's good to hear. Going to swap decklids for raceday? I used to have a red notchie like you and it makes me want to go back. I guess the grass is always greener. 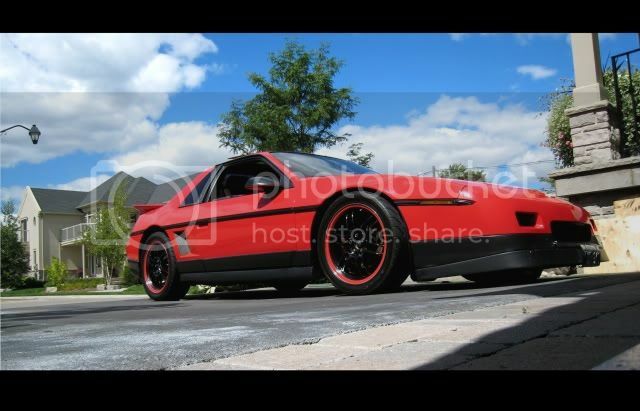 I think I'm definately ditching the silver trim and going all black. I think that's what I miss the most about the notch back. Silver just seems to clash. 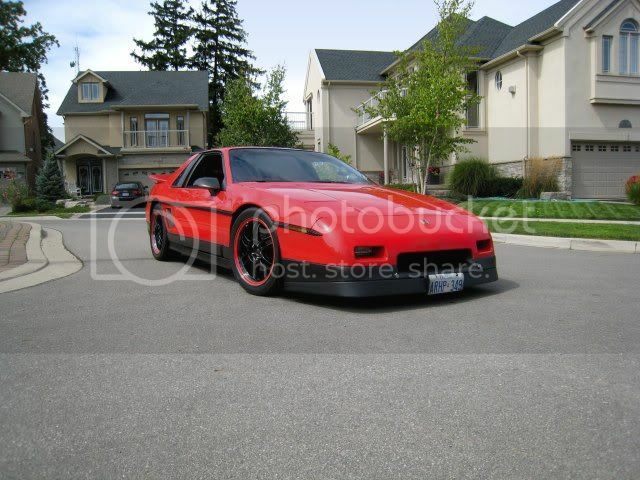 Wish I still had it. I miss my L67 the most. a good running 2.8 is nice and all, but man did that L67 cook! 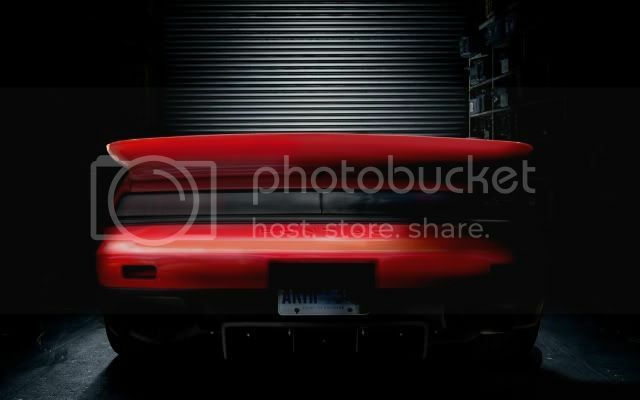 Yep, going to do a decklid swap on race days. Also going to have an easily removable splitter for race days as well. 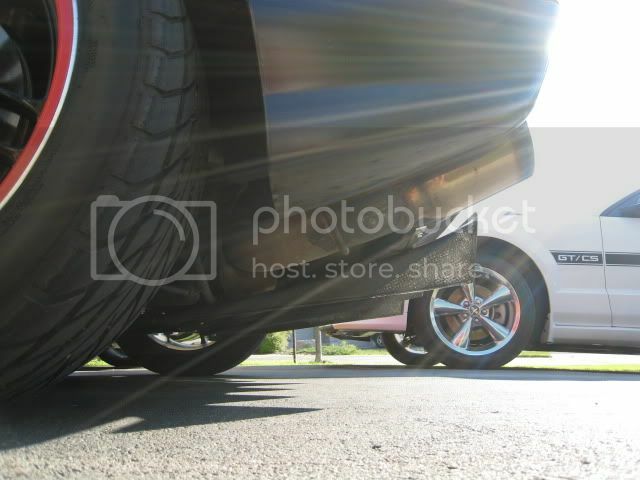 As of right now, the car is too low to run a splitter on the streets. 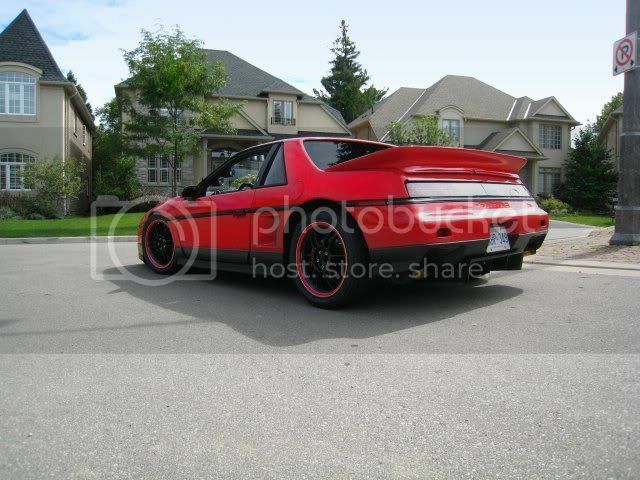 I think you should go for it and paint your GT ground effects black. You don't see too many fastbacks with that combination, it would look sharp! Thanks! Very flattering compliments, I appreciate it. wow.... that took me awhile but i read everything and im amazed. 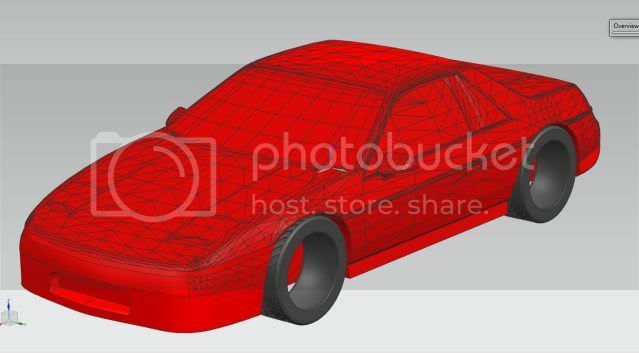 I am going to model my build like yours, slow but steady, and paying a lot of attention to detail. i just got my 87 GT in early December and have only driven it a handful of times. 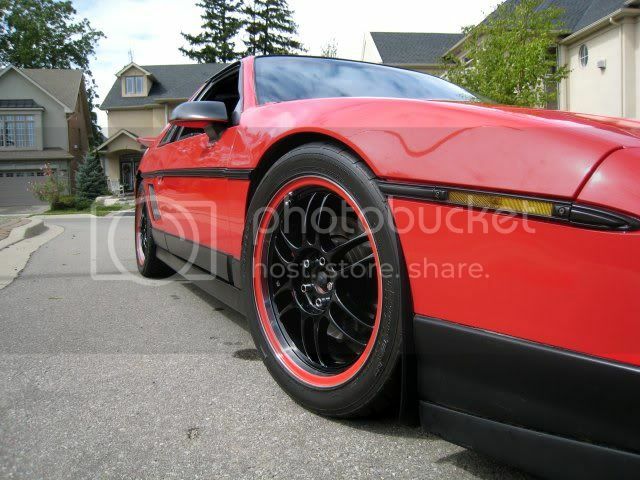 its sad but soon it will be summer and then we can show off our babies. Thanks Josh, I appreciate the kind words. This morning I was just thinking about all of the stuff I've done to the car. Going over the list in my head. Took me a while, but like you said, slow and steady!